Buying a wedding dress can seem very expensive when you do not have the money to pay full normal retail. But there are options. Here are seven ways to have your beautiful gown and save, too. In all cases–whether buying from a brick and mortar retailer or online–research the seller and specific item to be sure you are getting the quality you want from a reputable seller. 1. Buy a non-bridal gown. 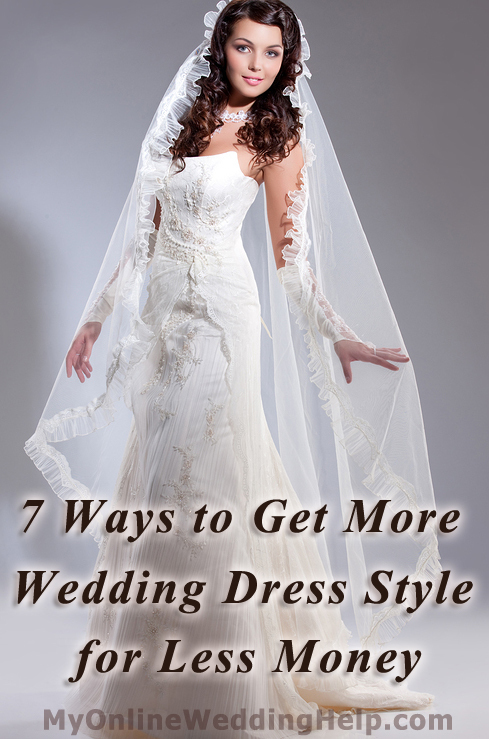 Your wedding dress doesn’t have to be a wedding dress. Many bridesmaid, prom, or other formal dresses–which tend to cost less than wedding gowns–come in white, ivory, or whatever color you prefer. Sometimes they are so elaborate you do not even know the difference! I read of one bride who wandered into the bridesmaid section without realizing it and found the gown of her dreams. 2. Make it yourself. If you or someone close to you has the talent, making the wedding dress can both save money and let you get exactly the features you want. 3. Have one custom made. If you are like most of us, you do not know anyone with the top notch skills required to actually make the dress. You can, however, have one made relatively inexpensively. Here are five top-rated sources that can do it for less than $500. 4. Shop sample sales. When the current year’s styles come in, bridal shops need to make room by clearing out their stock from last year. So they hold sales. Each store conducts theirs a bit differently, so get the details beforehand. Also, expect to find a narrow range of sizes, probably 8-12. 5. Buy through wholesale-priced online retailers. There are online stores that sell their own elaborately designed gowns for a fraction of what you would expect. BUT pay attention to reviews. There are a mix with good customer service and reputation and those with a poor reputation who are known to sell falling-apart gowns. So research first and also understand you will NEVER get the same quality of material and workmanship for $200-$300 that you would from a gown costing several thousand dollars. 6. Buy a donated gown. There are non-profit organizations that collect gowns from former brides to resell for charity. You will be saving money and helping a good cause at the same time. Brides Against Breast Cancer sells through their touring events and gives the proceeds to cancer patients and families. Expect to save 25% to 85% off full retail. There are also local organizations that collect and resell gowns. To see if there are any in your area, type “wedding dress” non-profit, followed by your state, into a search engine. 7. Buy a used gown from a resale marketplace such as Craigslist or eBay. There are also websites specifically for reselling wedding supplies. Search “used wedding gown” in one of the popular search engines or go here for a list of current used eBay auctions with free shipping.